The grand stair brings visitors up 15 feet from the lobby over a distance of 60' feet. The steps are made of precast concrete and handrails are blackened steel which are intended to translate the look and feel of black zinc panels around the windows on the second floor. Translucent glass guardrails were chosen to relate to the frosted panels at the clerestory. The wall next to the grand stair is finished with polished plaster. 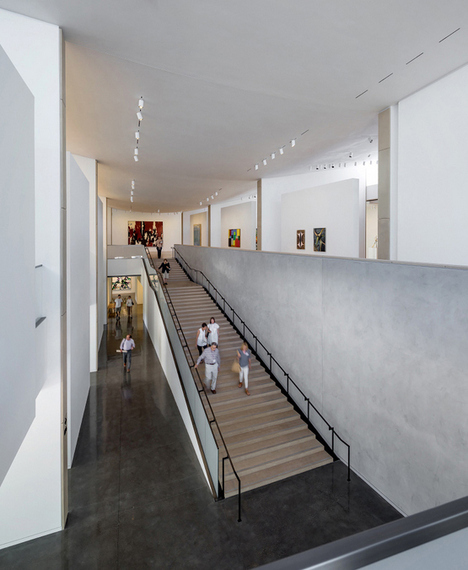 The stair's width varies from 10' at the bottom to five and a half at the top and creates a forced perspective while heightening the sense of transition from the ground level to the gallery. Upon arrival at the top of the grand stair, prepare to be confronted by the imposing red, black and ivory crags of Clyfford Still's monumental 1957-J No. 1 (PH-142). Still's uncompromising masterpiece sets the tone and sends a message: "You have reached the top of the art mountain." 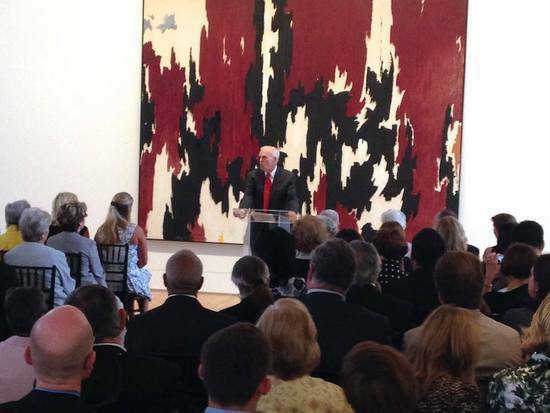 Speaking at the building's dedication on September 18, Stanford's President John Hennessy praised the Anderson's gift of 121 works by 86 artists as a "gift for the generations" and also noted with great pride that the Anderson would play a key role in the remarkable and ongoing "Stanford Arts Initiative." If you think Stanford is just a tech-incubator with a football stadium, think again: the opening of the Anderson makes the Stanford campus a genuine arts destination. 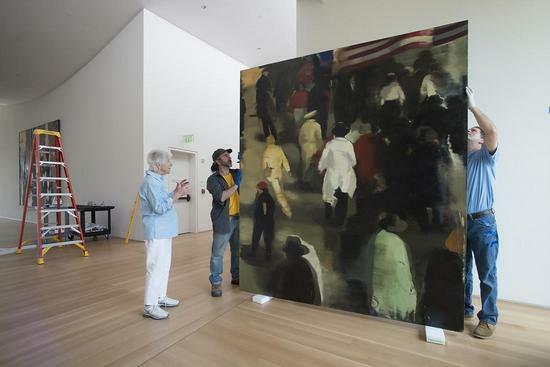 "Overnight," says Christopher Knight of the LA Times, "the Anderson Collection catapults Stanford into the top tier of American university museum art collections." Knight has that right, but I don't agree with his assessment of the Richard Olcott designed building which he dinged as "rather dull." I found the second floor galleries -- lit from above by a rim of semi-transparent clerestory windows -- serenely perfect. The Anderson Collection building is spacious, elegant and perfectly in tune with the collection it houses. One of the effects of the flowing "open room" gallery layout is that it creates a sense of egalitarianism that encourages each visitor to experience both individual works and groupings in their own way. In other words, the Andersons may have collected and donated the art, but each visitor is made to feel like the collection is their own: the sense of sharing is profound. As I ambled through the galleries I could almost hear Hunk and Moo asking me: "What do you think?" 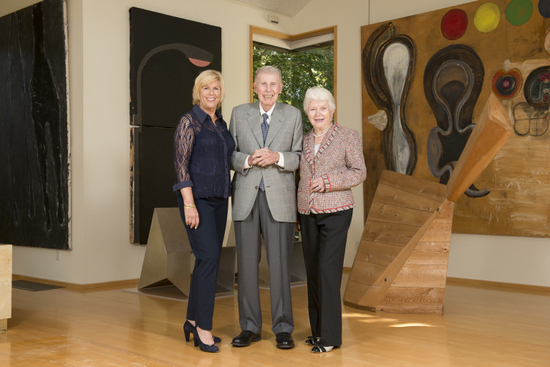 Mary Patricia "Putter" Anderson Pence, Harry "Hunk" Anderson and Mary Margaret "Moo" Anderson at their home in front of works by Donald Sultan and Terry Winters (2013): Photo © Linda Cicero. 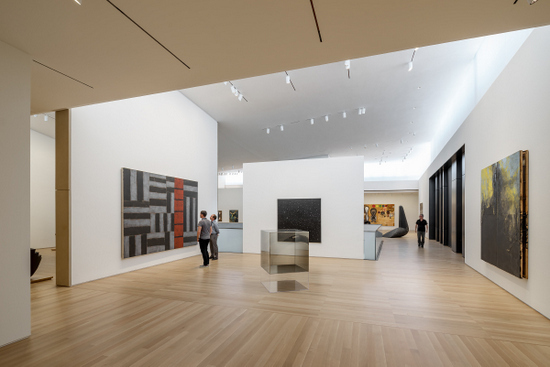 A great deal has been written about some of the collection's most precious works, and standing between Pollock's Lucifer and Mark Rothko's Pink and White Over Red is pretty cool, but what I came to see were the Bay Area paintings. A painter friend who doesn't quite share my taste once called me "one of those David Park people," and frankly I took that as a compliment. I think that one of the most valuable things that the Anderson Collection is going to do over time is to create a conversation between postwar art from both coasts. Along with Pollock, De Kooning and Rothko there are three Diebenkorns, three Oliveiras, two terrific Paul Wonners and a great David Park. 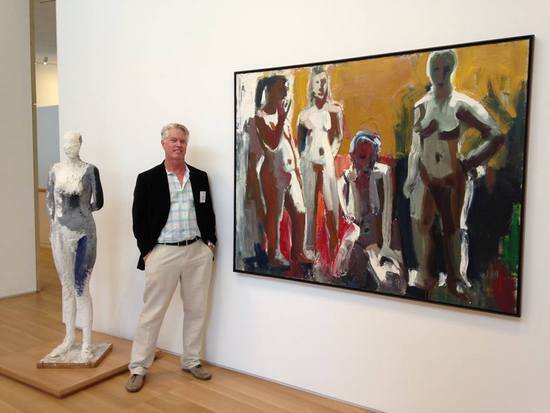 Elmer Bischoff and Joan Brown are conspicuously absent, but you can see their work -- and two more fine Diebenkorn canvases -- at the Cantor Arts Center next door. Add to that two Lobdell abstractions, terrific paintings by Christopher Brown and Squeak Carnwath and you will have some idea of how strong the presence of California painting is at the Anderson Collection. The reputation of California art is going to be lifted up by this great public display. There is so much to be said about what the gift of this collection will mean for Stanford, for California art and for the public, but I am going to keep it brief here and make just one more point: This collection was put together by a family that has a genuine passion for art. You can see it in the photo of Moo above as she showed up in her sneakers to watch a work being installed, and you could hear it in the remarks that Hunk made to a crowd of donors on September 19th. Apparently he cut himself a few years ago while assisting with the assembly of a large Frank Stella relief. Hunk got a nice laugh from the crowd when he mused that he may have left a little bit of blood behind on the piece. "It is really a Stella/Anderson work now" he quipped. I'm not so sure about that, but I doubt I will ever meet a family who have put more of themselves on the line for the love of art. Admission is free and advance tickets are not required for entry. Reserved timed tickets may be needed for some weekends: consult the Anderson Collection website for more information. The space is beautiful and inviting in these photographs--I want to be there. It reminds me of two other university galleries that I've visited and enjoyed: the Anderson gallery at SUNY/Buffalo and the Johnson gallery at Cornell, both having good things to look at, the Anderson in the city near the university surrounded by an urban neighborhood, the Johnson on the beautiful Cornell campus, near waterfalls, moving upward floor by floor, the viewer able to look alternately at the remarkable landscape seen through windows and the works of art on walls and in cases. We are fortunate that universities can make these oases happen.